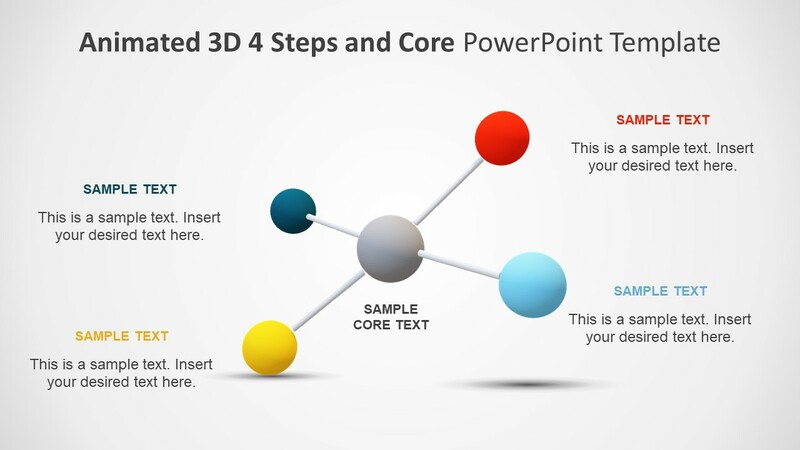 The Animated 3D 4 Steps & Core PowerPoint Template is a dynamic business presentation. It is an impressive design for introducing the company’s core values to its stakeholders. The template shows a round centerpiece diagram with four circular handles. These are the four segments, helpful in demonstrating 4 steps or separate components. 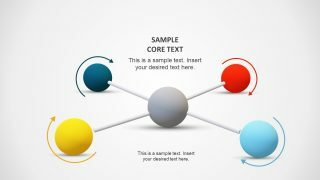 The core diagram shows each of the four components in distinct color to highlight them. 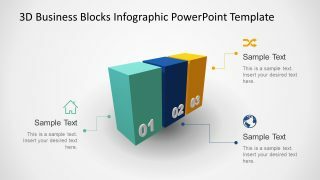 Further, the shapes of PowerPoint create a cross to display an intersection of all four segments. It is a pre-design PowerPoint template to display data in an audience-engaging animated format. 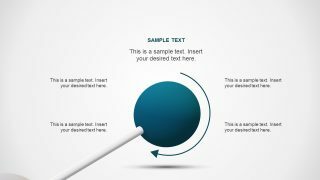 While the graphics of 3D PowerPoint templates have the slide transitions and animations enabled. The users can go ahead and modify the durations, delays, and effects. 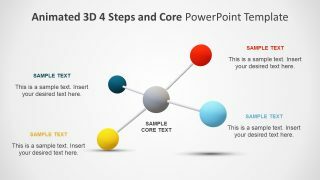 The Animated 3D 4 Steps & Core PowerPoint Template represents each segment in a unique animation. 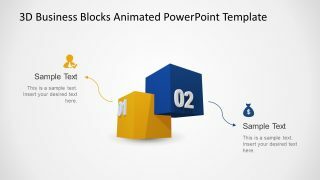 PowerPoint animated 3D shapes help improve the visual of a presentation by adding the graphic clarity to it. 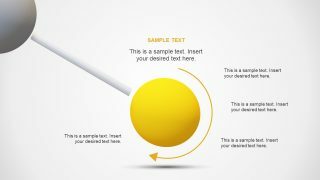 These graphics of 3D shapes template are also editable. 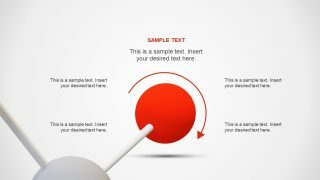 Thus, the presenter can alter the colors, size of the round segments, and the position of arrow direction shapes. 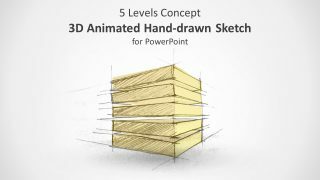 The animations of this 3D PowerPoint presentation will look amazing on the projector. Because it provides the zooming-in view of all four segments one by one. Apart from this, the 4 step diagram includes two overview slides at the start and end. The first two can display the subject titles and what they mean. Whereas, the last two can explain the same steps form the company’s viewpoint. 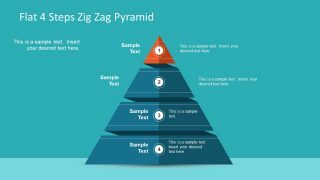 PowerPoint of animated 3D is ideal for displaying core competencies separately instead of following the traditional layer diagram. 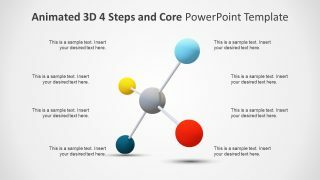 But the presenter can show many 4 step models or concepts using the 3D animated diagram. For example, customizing it for science and research diagram of chemical reactions. Similarly, it can present the physics learning concepts effectively. 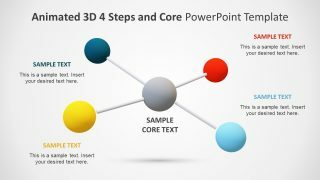 The PowerPoint template of 3D core diagram has animations to enhance the professional business presentations. And, all the slides contain text placeholders to add relevant information.